This is the approach that Daylight take to their well-worn brand of emo-tinged pop-punk. It's a corner of the musical spectrum that's been dominated by the likes of Brand New and Say Anything for the best part of a decade, and the emergence of this Pennsylvanian quartet isn't going to do anything to change that, but in perfecting the sound that they and so many others utilise they're slowly establishing themselves as a force to be reckoned with. Innovative they're not, but what they are showing is just how far being superior to the majority of your contemporaries can get you. Their third release in as many years, The Difference In Good And Bad Dreams sees the band continue to spruce up their instantly familiar yet admirably executed sound, and in doing so provides them with a perfect platform to build upon with their debut album, due towards the end of this year. All four members have already experienced life in bands from across the punk rock spectrum, so their credentials as musicians have never been in question, but even so the seamless nature with which they gel is impressive. But while the driving rhythm section and twin guitars never fail to keep things interesting, it's vocally where the key to Daylight's success remains. Former Bangarang! man Taylor Madison's powerful and gritty performances are without a doubt the band's defining characteristic, but it's with a harmonic backing that his voice works best, providing Sunny Day Real Estate-esque hooks which dominate their best songs. It's a ploy best sampled on 'Damp,' by far and away the best track here and perhaps the finest balance they've yet found between instrumental intensity and emo angst. It, along with the rest of the EP, bodes well for that upcoming full length, and should such momentum be maintained it's perfectly feasible that that record could establish Daylight as one of the mainstays in this most travelled of genres. 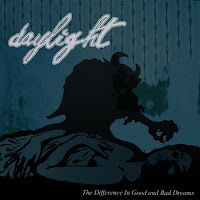 You can stream and purchase The Difference In Good And Bad Dreams on Bandcamp.